Anthem: " O Land of Beauty!" Saint Kitts and Nevis, officially the Federation of Saint Christopher and Nevis (or the Federation of Saint Kitts and Nevis), located in the Leeward Islands, is a unitary island nation in the Caribbean and the smallest nation in the Americas in both area and population. 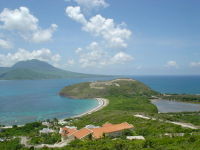 The capital city and government for the federated state is mainly on the larger island of Saint Kitts (formerly named Saint Christopher). The smaller state of Nevis (formerly named: Nuestra Señora de las Nieves) lies about 3 km southeast of Saint Kitts. Historically the British dependency of Anguilla was also a part of this union, which was then known collectively as Saint Christopher-Nevis-Anguilla. Although Saint Kitts and Nevis are geographically within the Leeward Islands, they are relatively close to a cluster of several other islands. To the north-northwest lie the islands of Saint Eustatius, Saba, Saint Barthélemy, and Saint Martin. To the northeast are Antigua and Barbuda, and to the south-east is Montserrat. 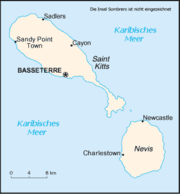 Both the names Saint Christopher and Saint Kitts are given in the Constitution of Saint Christopher and Nevis. Saint Kitts and Nevis along with Anguilla, both colonies of the United Kingdom, became an associated state with full internal autonomy in 1967. Angullians rebelled, and their island was allowed to separate from the others in 1971. St. Kitts and Nevis achieved independence in 1983. It is the newest sovereign nation of the Americas. In August 1998, a vote in Nevis on a referendum to separate from St. Kitts fell short of the two-thirds majority needed. In late September 1998, Hurricane Georges caused approximately $445 million in damages and limited GDP growth for the year. Alexander Hamilton, the first United States Secretary of the Treasury, was born on Nevis and spent his childhood there and on the island of St. Croix. The country is an independent Commonwealth Realm with Queen Elizabeth II as its head of state, represented in St. Kitts and Nevis by a Governor-General, who acts on the advice of the Prime Minister and the Cabinet. The prime minister is the leader of the majority party of the House, and the cabinet conducts affairs of state. St. Kitts and Nevis has a unicameral legislature, known as the National Assembly. It is comprised of fourteen members - eleven elected Representatives - three of whom are from the island of Nevis - and three Senators who are appointed by the Governor-General, two of whom being appointed on the advice of the Prime Minister, and one on the advice of the leader of the opposition. Unlike in other countries, Senators do not constitute a separate Senate or upper house of parliament, but sit in the National Assembly, alongside Representatives. All members serve five-year terms. The Prime Minister and the Cabinet are responsible to the Parliament. Saint Kitts and Nevis are a full & participating member of the Caribbean Community (CARICOM) and the Organisation of Eastern Caribbean States (OECS). The country has two main islands, Saint Kitts and Nevis. The highest peak is Mount Liamuiga, which tops at 1 156 m.
The islands are of volcanic origin, with large central peaks covered in jungle; the steep slopes leading to these peaks are mostly uninhabited. The vast majority of the population on both islands live close to the sea where the terrain flattens out. There are numerous rivers descending from the mountains of both islands, which provide fresh water to the local population. St. Kitts also has one very small lake. Saint Kitts and Nevis was the last sugar monoculture in the Eastern Caribbean. Faced with a sugar industry that was finding it increasingly difficult to earn a profit, the Government of St. Kitts and Nevis embarked on a program to diversify the agricultural sector and stimulate the development of other sectors of the economy. In mid-2005, the sugar economy in St. Kitts was finally shut down by the government, after running continuous losses for many years. As of this writing, the primary industry of St. Kitts is tourism. As of July 2000, there were 42,696 inhabitants; their average life expectancy was 72.4 years. Emigration has historically been very high, and the population is about 25% lower than at its peak of about 51,100 in 1960.